This weekend I am hosting a small neighborhood gathering full of Christmas cheer. You all will hear about it next week and I hope it will encourage you to get to know your neighbors a little better and try out a (possible) new craft. I am so excited. I am also excited to spend a little time in the kitchen for a few tasty treats to help us keep our crafting energy up. While planning for my small gathering I have been thinking of what I would like to make. So I thought you might enjoy a new recipe too! I even found a new blog during my searching. Sarcastic Cooking will become a new favorite I believe. Well, I mean, it already is. 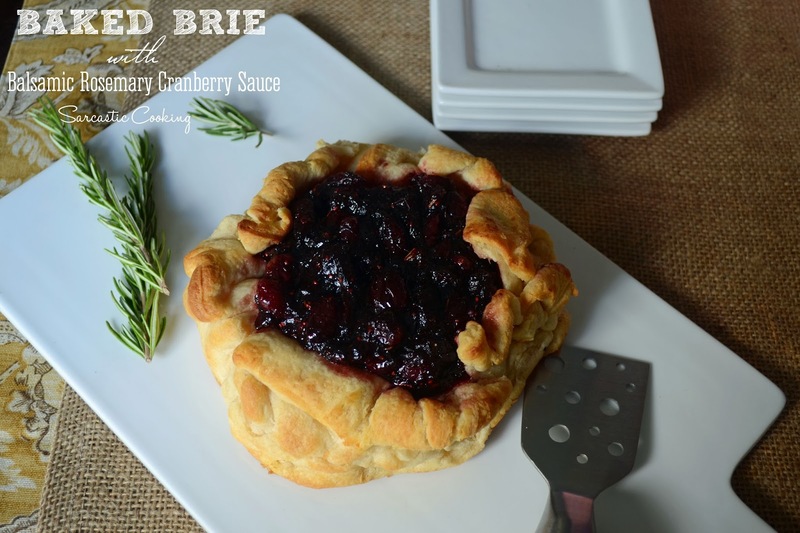 Stephanie shared a baked brie recipe with a twist of cranberry, balsamic and rosemary. I really wanted to make something with brie and cranberries but wanted to do something a little different than the norm...this sounds so fun and tasty! I'll let you know what the critics say. I'm working on a cranberry fizzy something to drink. I'll let you know what I come up with and share that once it is something worth drinking. In a small saucepan, combine cranberries, balsamic, sugar, rosemary, water, and salt. Stir to combine. Bring to a simmer over medium heat. Cook for ten minutes until thick. Cut the puff pastry/crescent roll dough into an 8x8-inch square. If you are using crescent roll dough, make sure to pinch all the seams together to make one cohesive piece of dough. Place the puff pastry on a greased baking sheet. Place the brie in the center of the dough. Pinch the dough up along the edges of the brie. Do not totally cover the brie. Brush all edges of the dough with the melted butter. Spoon the sauce on to the brie. Place the brie in the oven and bake for 12-15 minutes until the edges are lightly golden and crisp. Allow baked brie to cool for 5-10 minutes before serving and slicing.